Something good at school - I've been trying out some TPR and it has been working wonderfully! As I might have mentioned 5 times, we're working on force and motion, and the vocab is a little abstract! We've been making up motions for the definitions of "force" and "gravity" and the kids looooooove it. Another thing - and this will be a semi-long story. So I will start a new paragraph. I started Daily Five and never got past Read to Someone (so I still, at some point, need to introduce Word Work and Listen to Reading). Anyway, when I am teaching the first graders, the second graders are supposed to choose Read to Self, Read to Someone, or Work on Writing, and vice versa. This week, I had another teacher in my room during reading time, and I gave her some things to do with the first graders while I worked with the second graders, so I basically took away their independent reading/writing time. They were NOT happy. One girl almost cried when the other teacher took her independent reading book away. This made my day. Although my class is WAY too chatty during independent reading/writing time, they are actually doing it! And they love it! This makes me so so pleased. Something good at home - I hung out with my brother this weekend! We both moved out in August and we have only seen each other like twice since then, which makes me sad. This weekend, we went out to eat a lot, went to a little fair, and just spent time together. Love my broski. I hope your Sunday has been stress-free and that you are ready for the kids tomorrow!! 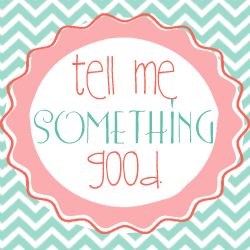 :) What good things are going on in your life? Go link up! That's great about the kids loving their read to self! Step one: get them to like reading - CHECK! OOOOH! Sounds like your first and second graders are really loving reading! That's SO FABULOUS! My kids can earn things with compliments and they really want a "Read-a-thon" so they can bring a bunch of books to school and read all afternoon!